Many times a woman will go to the doctor’s office and describe a chronic, sometimes very painful condition in her groin. If she is like other women we have seen in our office she has had the tradition treatments and the traditional “speculations,” as to why she is suffering with this groin pain. Groin pain and tenderness develops from a variety of causes including athletic and non-athletic injuries as well as internal anatomical factors. Overlooked in the complexity of trying to diagnose nondescript or difficult to groin pain is ligament laxity. Ligament laxity is weakened, frayed ligaments in the low back, pelvis, groin area and hips that often go undiagnosed or even unrecognized as a possible cause of groin pain. These laxity problems can result in Iliolumbar syndrome, iliopsoas injury, pubic symphysis injury, osteitis pubis and other problems. In women, groin pain can also be caused by certain medical conditions like an inguinal hernia, kidney stones, ovarian cysts, bacterial infections, swollen lymph nodes, sexually transmitted diseases, urinary tract infections, infections of the large intestine, ringworm, yeast infection, and cellulitis. These causes should be explored as well. Once infections or other causes are ruled out, the next step is to find a pain source. This is where the speculation comes in. If you are reading this article it is very likely that you have done a lot of reading and a lot of researching to help find answers to your groin pain challenges. We are going to list possible causes for your groin pain. We are going to discuss Comprehensive Prolotherapy treatments as a possible remedy. The question as to whether these treatments will help you is something that would need to be discussed with a healthcare provider familiar with the challenges of your type of groin pain, the symptoms it is causing you, and with knowledge of Prolotherapy treatments. At the bottom of this article, you can ask our staff questions. Anna Hamman attended the United States Air Force Academy. Upon graduation, in 2003, she entered the United States Air Force. 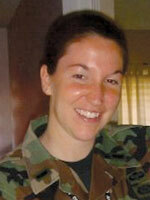 Anna completed six years of active duty service, including deployment to Iraq as an Intelligence Analyst. Anna has been a competitive swimmer since she was 10 years old. Over the years, and particularly following the birth of her first child, Anna developed widespread pain along her groin, hips, and lower back. She sought treatment as these problems progressed in severity. 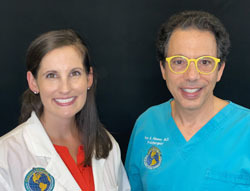 Despite being active for many years, she made the proactive decision to leave the Air Force once the military medical community began suggesting pelvic fusion surgery to “fix” her problems. Anna continued to seek medical treatment in the allopathic and osteopathic communities, as well as extensive chiropractic and physiotherapy. Unfortunately, these treatments were all minimally successful at best. Anna then turned to Prolotherapy and has received outstanding results. In the Journal of Prolotherapy, a patient of ours Anna Hamman documented her long road to recovery from chronic pain after childbirth. Anna suffered chronic pelvic and low back pain for three years following a difficult and very late delivery of her son. and intense low back pain (8/10). These symptoms grew over time to include upper back /collarbone pain (5/10) and pelvic floor pain (5/10). The patient continues: “As time began to pass, I tried my best to return to the active lifestyle I had before. However, I soon realized that I had suffered a severe injury that was not going to heal without proper medical attention. Thus, my quest to figure out what was causing me so much pain began. At that time, I was an active duty captain in the United States Air Force. I say this to make the point that I was not only an athletic person by nature, but it was required that I maintain a certain physical standard to stay in the military. For the first six months following (childbirth), I kept taking the advice of the military doctors, that with time and physical therapy my body would heal itself so that I could return to being the active woman I was before my pregnancy. I pushed myself to return to my normal exercise routine even though the pain was extremely intense and much worse with exercise. Time passed, the doctors ran some preliminary tests to ensure nothing obvious was being overlooked. A year into my quest to find an answer to my chronic pain, the only diagnosis I had included a “minimally bulging disc material present at L1-2, L4-5, and L5-S1, as well as an annular tear in the midline of L4-5,” and “minimal sclerosis of the right sacroiliac joint.” Not having identified the true injury to date, I did not realize at the time, that all of the above-mentioned injuries were developing because of the underlying problem that no doctor had yet been able to diagnosis. 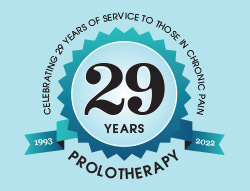 Anna’s story in the Journal of Prolotherapy ends: “At my last appointment, I reported an overall 85-90% decrease in pain. Additionally, I have had recent MRI scans run, and there are no longer any bulging discs to report in my lower back—a true testament to the Prolotherapy treatments. . . ” You can read Anna’s entire story here: Our Story: Pelvic Floor Dysfunction helped with Prolotherapy and Natural Medicine. Below in this article, we will discuss Prolotherapy treatments. In our article comp[anion article Pelvic Floor Dysfunction | Confusing diagnosis can lead to confusing and improper treatment we discuss new research and what doctors are recommending moving forward in the treatment of Pelvic Floor Dysfunction in women. We will also look at how Prolotherapy treatments may provide an answer to the problems of bowel movement dysfunction, urinary incontinence, unexplained back and pelvic pain and other symptoms attributed to Pelvic Floor Dysfunction. In the story above you saw how one woman had her groin pain diagnosed as low back pain being caused by herniated discs. This is not a rare occurrence. In a paper from October 2017, Japanese researchers publishing in the medical journal Clinical neurology and neurosurgery looked to identify the prevalence of groin pain in patients with sacroiliac joint dysfunction, lumbar spinal canal stenosis, and lumbar disc herniation who did not have hip disorders. and 124 (83 men, 41 women, average age 50 years) with lumbar disc herniation. the pain areas in the buttocks and back; including pain increase while in positions such as sitting, lying supine, and side-lying; an sacroiliac joint dysfunction shear test (manual physical examination of range of motion); and four tender points composed of the posterior superior iliac spine (PSIS), long posterior sacroiliac ligament (LPSL), sacrotuberous ligament (STL), and iliac muscle. Please see our article on the role of ligaments in spinal instability and chronic back pain. and three had stenosis below L3-L4. The other five presented with lumbar radiculopathy: the corresponding nerve root was L2, L3, and L4 in one patient each, and L5 in two. and 10 (8.1%) with lumbar disc herniation reported groin pain. Eight presented with radiculopathy: the corresponding nerve root was L2 and L4 in three patients each, and L5 in two. Two patients presented with L4-L5 discogenic pain without radiculopathy. In patients with groin pain, pain provoked by the sacroiliac joint dysfunction shear test and the tenderness of the posterior superior iliac spine and long posterior sacroiliac ligament were significant physical signs that differentiated SIJ dysfunction from lumbar stenosis and lumbar disc herniation. The prevalence of groin pain in patients with SIJ dysfunction was higher than in those with lumbar stenosis and lumbar disc herniation. Comment: There is a connection between groin pain and low back pain. A detailed physical examination is needed to explore this relationship in the patient to determine a proper treatment path. Groin pain is most commonly caused by ligament injury or weakness and is especially common in athletes in various sports. For example, hyperextension of the groin during an athletic event or extreme stretching or any workout activity can lead to a strain or sprain of the groin and chronic conditions. Groin pain in women can be more chronic, and worsen over time, such as with overuse injuries when the same activity is repeated day after day. Or, it can be acute, and occur immediately after an injury such as a direct blow or a fall, or from turning the leg in an abnormal position. High impact falls and blows directed at the groin area cause severe groin pain. 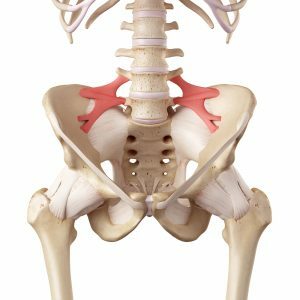 The groin areas are located on each side of the body in the folds where the abdomen joins the inner, upper thighs. The pubic area lies between the two groin areas. The groin is also called the inguinal area. The groin area is prone to acute injury when involved in rigorous activities. Muscle pulls and ligament strains are also common. While mild groin injuries tend to heal on their own, special medical attention is required for cases that lead to severe groin pain and discomfort. In research from May 2016, doctors writing in the British Journal of Sports Medicine tackled the problem of groin pain diagnosis. The doctors representing multi-national institutions including the USA confirmed that athletic groin pain requiring surgery remains a diagnostic and therapeutic challenge. In their paper, they sought to identify the most common causes of groin pain in athletes requiring surgery. femoroacetabular impingement (FAI) (32% of cases), is a “bone-on-bone” situation which causes damage in the joint. Of the two types of FAI is the “cam-type” where the femoral head-neck junction is abnormal and the “pincher-type” FAI is where the acetabulum shape or its configuration within the pelvis is abnormal. The head of the femur meets with the pelvis at the acetabulum. Some people have both types of FAI. Both cause injuries to the labral area because of repetitive impingement stress. They either cause labrum degeneration or labrum tears. Like other causes of premature hip osteoarthritis, sometimes surgical procedures are needed. The operative procedures are designed to address the adverse mechanical effects of impingement and hopefully address the reasons for it. 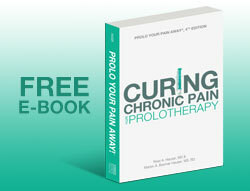 Sometimes a combination of Prolotherapy and surgery is required. Athletic pubalgia or sports hernia (24%). More commonly referred to as sports hernia, this is a tear of soft tissue in the lower abdomen or groin area. Adductor-related pathology – problems with the tendons (12%). In our office, we find adductor muscle/ tendons are getting irritated because they are contracting against an unstable base. That unstable base is the pubic symphysis. The real problem is not a tight adductor muscle (this is why stretching it never gets rid of the problem) or a weak one (you can strengthen the adductor muscle massively and you’ll still have pain), but an injury to the pubic symphysis itself or the pubic symphysis ligament. Inguinal pathology (10%) an incompetent abdominal wall in the groin. Sometimes a bulge will appear, in some cases of groin pain, there is no palpable hernia. In such cases, what is sometimes found are microscopic tears of the internal oblique muscle in the area of the muscle that attaches to the superior pubic symphysis. On physical examination, there is tenderness of the pubic tubercle and a positive jump sign is elicited. 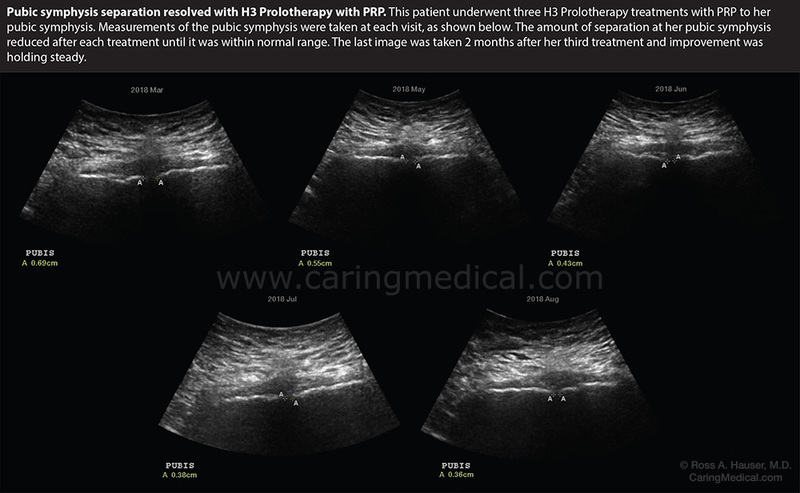 Prolotherapy injections, in this instance, to the muscle attachments onto the pubic symphysis is often curative. All of the other muscle attachments to the groin area, including the rectus femoris, gracilis, rectus abdominis, and adductor group, can all be treated with Prolotherapy if there are tenderness and reproduction of the athlete’s pain upon palpation of the area where the muscle attaches to the bone. If a positive jump sign is elicited, the diagnosis is made and Prolotherapy is given to the weakened fibro-osseous junction. labral pathology (5%) (labral tear causing groin pain), with 35% of this labral pathology specifically attributed to FAI. (7) See our article on hip labral tears. Iliolumbar syndrome, also known as iliac crest pain syndrome, involves an inflammation or tear of the iliolumbar ligament. This ligament extends from the spine to the iliac crest, which is the back of the pelvis. It can lead to referred pain in the groin, the pelvis, the hip, the back, vaginal and rectal areas. What are the symptoms of iliolumbar syndrome? Pain may be experienced in the hip or groin area. The area involved may be tender as well. Other symptoms of iliolumbar syndrome include recurrent attacks of acute low back pain in the area referred to as the “multifidus triangle” – the facet joints, erector spinae muscles, lumbar fascia, quadratus lumborum and the iliolumbar ligaments. Painful attacks are often brought on by physical exercise involving bending and twisting of the lumbar spine. Some individuals complain of pain only after prolonged sitting or standing or for a brief period in the morning after getting out of bed. 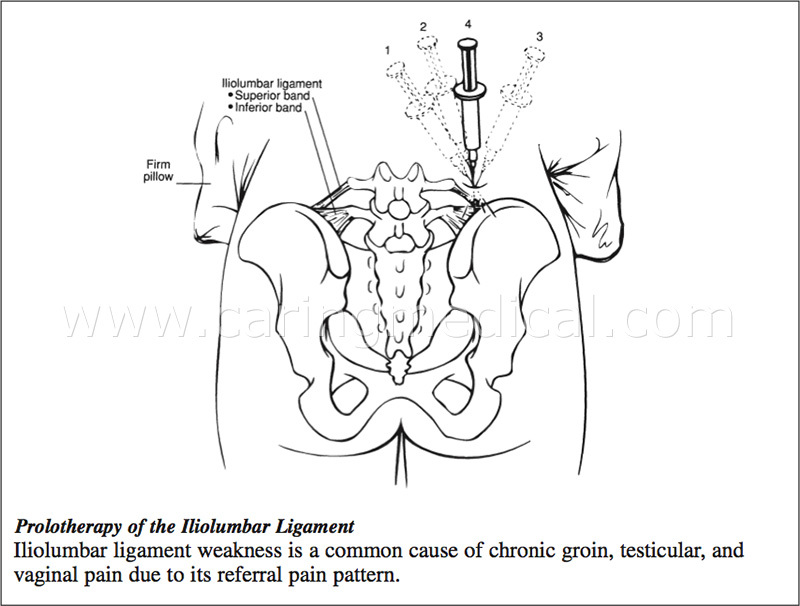 Groin pain coming from an injury of the iliolumbar ligaments may at times be mistaken for hernia injury. It is important to rule out all of the possible causes of groin pain. Injury to the iliopsoas tendon can also cause groin pain. Per Hölmich of the Department of Orthopaedic Surgery, Amager University Hospital, Copenhagen wrote in the British journal of sports medicine of groin injuries in athletes, 9 of the 11 women had iliopsoas‐related groin pain as the primary clinical entity. (9) Iliopsoas tendonitis is most commonly caused by an acute injury, usually due to quick movements. It is also caused by overuse injuries of repeated hip flexion, as in certain athletic activities such as soccer. Iliopsoas pain is generally felt deep in the groin and extends around to the front of the hip and may radiate down toward the knee. The pain may also be noted in the lower back and buttocks. Stiffness in the groin, hip, and even knee may also occur. Sometimes the iliopsoas tendon is the cause of snapping hip syndrome. When this is the case, patients may experience no problems other than the annoying snapping. We had a case of an athlete with tenderness at the iliopsoas muscle with degeneration of the lumbar spine per MRI. The joints beneath the iliopsoas muscle are the hip joint and the lumbosacral junction (where the degeneration was located). Palpation of the hip joint did not produce pain, but a positive jump sign was elicited at the iliolumbar, lumbosacral, and sacroiliac ligaments. Since an experienced Prolotherapist understands ligament pain, referral pain, as well as palpation of the various areas, he/she will be able to differentiate and localize the area of pain. Groin pain coming from an iliolumbar ligaments injury or dysfunctions at the thoracolumbar junction (vertebrae T11,T12,L1), may at times be mistaken for hernia injury. Patients have been referred to us after hernia repair, because the hernia repair failed to stop their groin pain. The groin pain had nothing to do with a hernia! Again, all of the possible causes of groin pain need to be considered and ruled out. The pubic symphysis is a fibrocartilaginous disc. Groin pain due to laxity of the pubic symphysis is experienced while performing such activities as running, doing sit-ups and squatting. Athletes who participate in sports with repetitive kicking, side to side movement, and twisting are also more at risk. Pain and tenderness are localized over the pubic symphysis and radiates outward to the upper thighs and perineum. Pubic symphysis pain may be mild or severe and can develop into a chronic condition. In more severe cases, the pain affects activities of daily living and causes the sufferer to walk with a waddling gait, as pain is experienced while walking, climbing stairs, coughing, and sneezing. It can be a burning, shooting, grinding or stabbing pain. The person also experiences exquisite tenderness to touch in the pubic symphysis area. Osteitis pubis is a chronic condition affecting the pubic symphysis and/or parasymphyseal bone that develops after athletic activity. The pain is usually aggravated by running, cutting, hip adduction and flexion against resistance, and loading of the rectus abdominis. Individuals with osteitis pubis commonly present with anterior and medial groin pain and, in some cases, may have pain centered directly over the pubic symphysis. Pain may also be felt in the adductor region, lower abdominal muscles, perineal region, and inguinal region. They also present with INFLAMMATION. If the diagnosis of osteitis pubis is commonly made, which means that the pubis is inflamed, ice, anti-inflammatories, rest, physical therapy, and anything else that can be thrown to the sufferer to decrease the inflammation is given. Because the body is trying to heal the pubic symphysis area by inflammation this is exactly the opposite of what is needed. Inflammation of the pubis is a sign that the pubic symphysis area is trying to heal something. On bone scan, there is evidence of increased circulation to the area and on x-ray, there is often sclerosis or an overgrowth of bone. Sometimes patients come in with the diagnosis of pubalgia or some other kind of -algia. What they do not know is that the -algia prefix just means “pain.” A diagnosis of pubalgia, therefore, just means groin pain. In other words, the doctor who gave them the diagnosis had no idea what the cause of the groin pain was except that they have pubalgia, or groin pain. 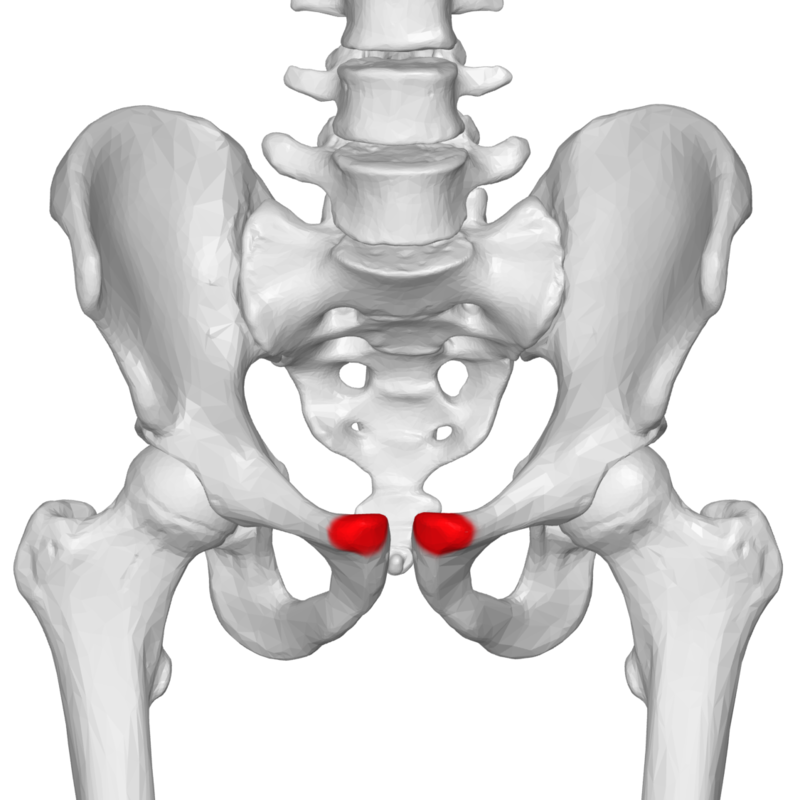 In our opinion, the most common cause of pubalgia, or groin pain, is pubic symphysis diathesis or injury to the pubic symphysis itself. Hip bursitis can cause pain that radiates to the groin. Pain or injury in other body parts may radiate toward the groin, and thereby cause pain. For instance, the pain caused by a pulled back, thigh or leg muscle, and ligament injury, may radiate towards the groin and result in pain. Spine problems in the back near the lower ribs can pinch the nerves that travel through the groin area and cause groin and thigh pain. Pulled muscles, ligaments, or tendons in the leg may cause symptoms in the groin. Stressed ligaments or tendon fibers may cause female groin pain. Groin pains are experienced during various phases of pregnancy, as the hormonal changes cause slackness in the pelvic joint. Some women experience pain in the lower back, genital area, upper thighs and hip joints. Since groin pain can have a variety of causes, treatment will depend on the results of the examination and tests performed. As mentioned previously, ligament and tendon injuries are a common cause of groin pain. When this is the case, physicians commonly recommend complete rest, applications of ice, and anti-inflammatory medications. Although this treatment approach may bring temporary relief, it does not repair weakened ligaments or tendons. Steroids may also be recommended. These treatments have all been shown to inhibit the healing process of soft tissues and accelerate degeneration. We have discussed that groin pains are often the result of referral pain from the hip and other regions of the body. Ligament laxity of the iliolumbar ligaments of the hip and the ligaments of the pubic symphysis joint are the most common ligaments involved in referral pain to the groin. These ligaments can be strengthened with Prolotherapy and Platelet Rich Plasma therapy. The Prolotherapy specialist understands the referral patterns of these ligaments and will palpate the various areas that may be involved. A good history from the patient regarding the injury and description of the pain along with the palpation will help the Prolotherapist to locate the involved ligaments and tender areas and make the appropriate diagnosis. If snapping hip and the iliopsoas tendon and/or the iliolumbar ligament are involved, Prolotherapy to the posterior hip capsule and the involved ligaments and tendons will tighten the joint and stop the anterior protrusion of the hip. In other words, Prolotherapy helps resolve snapping hip syndrome because the underlying etiology of the problem is most often hip ligament laxity, and not tight muscles or tendons. Prolotherapy for groin pain due to osteitis pubis or pubic symphysis diathesis entails injections into the fibro-osseous junction of the superior pubic symphysis ligament and injections into the pubic symphysis itself. Prolotherapy is extremely effective in strengthening the pubic symphysis and relieving chronic groin pain in this area. There are times when the entire pelvic floor is involved and may need to be treated. This again is due to the fact that laxity in one area of the pelvis often leads to laxity or pain or weakness in another area of the pelvis. Back pain can also cause pain in the groin, and if the back is involved, the sacroiliac joint at the back of the pelvic bone may be involved. 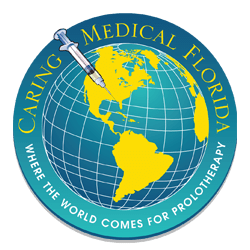 Prolotherapy treatments may relieve the unresolved back pain, as well as abdominal or inner leg pain, because they are all part of the referral pain pattern of the ligaments involved. When treating groin pain in women, Prolotherapy can help heal injured ligaments that may be referring pain to the groin. Prolotherapy works by initiating a mild inflammatory response in the treated area by injecting a solution that includes D-glucose. D-glucose is the normal sugar in the body, and when injected activates the immune system. The body’s normal healing inflammatory reaction boosts the blood flow to the area and stimulates the release of immune cells to the ligaments and soft tissue areas being treated. These cells are natural reparative cells, which will cause regeneration and repair of the weakened ligaments. Once the ligaments are strengthened, the referral pain will stop, and the groin pain will resolve. Prolotherapy offers the most curative results in treating chronic groin pain. It effectively eliminates pain because it attacks the source: the fibro-osseous junction, an area rich in sensory nerves. What’s more, the tissue strengthening and pain relief stimulated by Prolotherapy is permanent! If you have questions and would like to discuss your groin pain issues with our staff you get help and information from our Caring Medical staff.